This photo of the comet C/2014 Q2 (Lovejoy) was taken on Feb. 12, 2015 by French amateur astronomer Fabrice Noel, 31 miles (50 kilometers) south of Paris. (4 minute exposure, 6400 ISO, Sony A7s DSLR). The basic building blocks of life may have been present on Earth from the very beginning. Astronomers detected 21 different complex organic molecules streaming from Comet Lovejoy during its highly anticipated close approach to the sun this past January. Many of these same carbon-containing compounds have also been spotted around newly forming sunlike stars, researchers said. The IRAM 100-foot (30 meters) radio telescope in Spain’s Sierra Nevada mountain range. Biver and his colleagues studied Comet Lovejoy with the Institut de Radioastronomie Millimétrique's 100-foot-wide (30 meters) radio telescope in Spain during two separate three-day stretches in January 2015. That's when the spectacular, green-hued comet was making its closest approach to the sun. 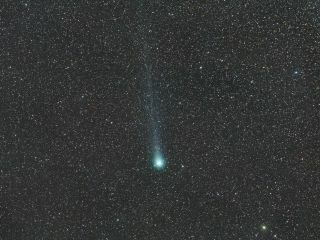 The sun's heat drove a great deal of material from the comet's surface out into space; indeed, Lovejoy was one of the most active comets to cruise through Earth's neighborhood since the superbright Hale-Bopp in 1997, the researchers write in the new study, which was published online today (Oct. 23) in the journal Science Advances. Biver and his team spotted 21 different complex organics in the cloud of material surrounding Lovejoy, including two — ethyl alcohol and the simple sugar glycolaldehyde — that had never been seen in a comet before. The researchers also calculated the abundances (relative to water) of each type of organic molecule, and compared these abundances to those of organics observed in Comet Hale-Bopp and around two "protostars" by other research teams. Overall, organics are quite abundant in comets — often more abundant, in fact, than they are around newly forming stars. This result is "in line with their [organics'] synthesis through grain-surface reactions and ice irradiation in the early solar nebula," Biver and his colleagues wrote in the study. Modeling work suggests that the solar system's four biggest planets — Jupiter, Saturn, Uranus and Neptune — migrated significantly in the solar system's early days. Some of these dramatic movements likely sent huge numbers of comets careening toward the realm of the rocky planets, which includes Earth and Mars, 4 billion years ago or so. "So even if Earth was born dry and depleted of volatile elements, complex organics formed further away may have been supplied in large amount via comet nuclei early and certainly contributed to the emergence of more-complex molecules and ultimately life," Biver said.